Brisbane bounced back from two disappointing defeats to send Perth to the bottom of the table. Mike Mulvey named the same side from last week’s loss to Melbourne Heart, except for the inclusion of Dimitri Petratos ahead of Henrique on the right. Kenny Lowe kept with the same attacking quartet from the preceding fixture against Western Sydney, but made changes in deeper positions – Steve McGarry was replaced by Jacob Burns, while youngsters Jack Clisby and Brandon O’Neill came into the back four. Perth defended deep in numbers for most of the match, but were forced to attack more after going behind, which played into Brisbane’s hands. Initially, Perth looked promising early on when they bypassed the midfield altogether to attack Brisbane directly, with simple long balls over the top causing problems for the back four early on, particularly down their right-hand side (Perth’s left). Sidnei got in behind from a basic Danny Vukovic kick upfield, and then again a few minutes later when Perth countered quickly having won the ball off Brattan in midfield – Sidnei probably should have done better with the shot having had lots of time and space to drive into. Later, Clisby was free to raid forward having run onto a Sidnei flick-on, although his cross wasn’t threatening. It’s become clear in recent weeks this is the most effective way of attacking Brisbane. Taggart’s pace in behind on quick counter-attacks lead to multiple chances in Newcastle’s win at the same ground two weeks ago, while the Heart constantly looked dangerous when their front three carried the ball forward on transitions – neither team looked to build up play through midfield, and instead created attacks with direct balls from deep positions, just as Perth did in the opening moments here. Even when they did try to build passing moves slowly from the back, Perth looked uncomfortable, lacking composure to work the ball around Brisbane’s pressing. Eventually, though, the game settled into the predictable pattern – Perth defending deep, and Brisbane controlling possession. Brisbane’s dominance of territory was particularly obvious, with the two centre-backs both spending much of the game sitting on halfway, cleaning up loose balls and then immediately restarting attacks – they finished as the game’s highest passers. The number and nature of the attacking third passes by either team summed it up – Brisbane methodically working the ball forward, contrasting with Perth’s directness. With Brisbane having so much of the ball, the game’s major talking points stemmed from their attacking patterns of play, and in this regard, McKay’s movement was fascinating. He was constantly positioning himself backwards and forwards between the lines, but also moving laterally across the midfield zone – even sometimes extremely wide on the left, to complement Broich’s movement infield. This caused particular problems for his nominal marker, Rostyn Griffiths (the right-of-centre Perth midfielder), who seemed unsure of what to do when McKay varied his position. As a result, Brisbane looked dangerous when creating attacks down the left-hand channel, as mentioned last week. 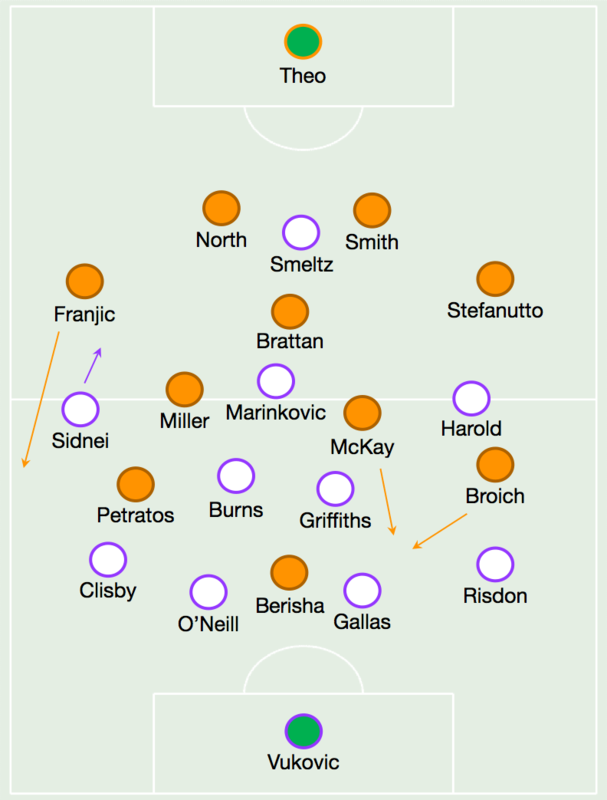 To paraphrase, the combination of Broich, McKay and Shane Stefanutto overlapping creates multiple angles of attack, and Brisbane repeatedly got into promising positions in this area of the pitch. 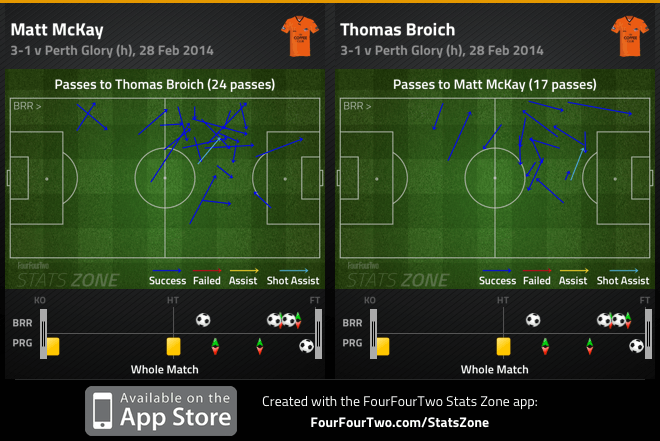 Broich and McKay linked up throughout, and played neat 1-2s around Perth midfielders. A recurring issue for Perth is leaving too much space between the lines, conceding lots of goals from in recent weeks from being too open in this zone – like Sydney FC’s opener two weeks ago when Alessandro Del Piero slipped Ranko Despotovic in behind, and last week when Mateo Poljak stormed forward to curl home the Wanderers’ opening goal. They improved in this regard this week, but it was still an issue. Griffiths was cautioned when McKay darted into a pocket of space in behind him, then later, Burns gave away a free-kick near the edge of the area. Griffiths was again lucky to escape a yellow when sliding in on Broich near the end of the first half, but was eventually booked a minute into the second when McKay darted past him. Meanwhile, on the opposite side, Franjic pushed forward energetically from full-back to allow Petratos inside. The latter had a succession of chances from a narrow, right-sided position – sweeping a shot wide of the far post in the 6th minute, coming close with a volley off Broich’s hanging cross in the 17th minute, and then not anticipating a low cross that he could have got on the end of (much to the dismay of the commentary team). A secondary by-effect of Franjic’s forward running was how deep it forced Sidnei. The winger defended reliably, but had an incredible amount of distance to cover when Perth turned defence into attack. A final consideration of Brisbane’ s attacking play was Berisha, whose movement into deep positions last week removed some of the Roar’s penetration higher up the pitch. He wasn’t as extreme here, although typically scrapped back on a few occasions to try and win the ball – but because he likes to position himself just in front of defenders to collect passes on the turn in anticipation of a shot, Gallas was often drawn out of the back four. The Frenchman played the ‘Gerhardt’ role, defending close to Brisbane players that were unmarked between the lines – but Perth’s back four didn’t seem cohesive (understandable, given the number of changes Lowe has had to make there), and O’Neill didn’t get into covering positions when Gallas was higher upfield – meaning there was an obvious weakness to be exploited if Gallas was beaten on the turn (which, in fairness, didn’t happen much here). Little changed after the interval, except Sidnei briefly came over to the right – perhaps, in light of Perth’s assistant coach suggesting that the Brazilian had to be constantly reminded by Lowe to remember his defensive duties throughout the first half, a move designed to have Harold tracking Franjic – although not long afterwards, the two switched back to their flanks from the first half. Brisbane took the lead from a set-piece, with Franjic heading in from close range. That forced Lowe into action, and he made a double change – Steven McGarry replacing Griffiths (whose booking probably guided the thinking behind that substitution), while Darvydas Semas replaced Marinkovic. Unsurprisingly, Perth also became more positive with their approach – the defence pushing up more, and the attackers now pressing rather than dropping off. Sidnei benefitted most from this, receiving service in more advanced positions – his skill in 1v1 made him a useful outlet down the left, and he dribbled past Franjic on a few occasions after the goal to find space to cross (with McGarry mishitting a fine chance in front of goal on the hour mark). As most sides generally do, Brisbane looked better attacking in a more open game. They could pass the ball forward quicker, and had more space in which to create. Petratos got in behind from a quick counter but fluffed the finish, while later, Broich played Berisha in behind having been free to receive a diagonal ball wide on the left with lots of space to attack – something that rarely happened in the first half. The difference between attacking eight players behind the ball, and attacking a side chasing the game can be massive – Brisbane’s shots count tripled in the second half. The second goal was a comedy of errors more than anything, but reflected Brisbane’s superiority, while the third stemmed from a quick counter led by Berisha, topped off by Broich’s fine finish. Perth got a consolation when the ball was given away cheaply inside their own penalty box – but the game had been won. Although there’s lots to talk about here, this game didn’t reveal anything particularly new . We know Brisbane dominate possession, that Broich and McKay work well down the left, that Berisha drops off from striker and that teams invariably defend deep against them, soaking up pressure and then attacking directly with pace in behind. It’s why the first goal is so important – score it, and Brisbane have more space to attack as opponents chase the game. Concede it, and Brisbane have to break down a packed defence – something the games against Newcastle and Heart have shown to be a difficult challenge.